North Carolina Land Co. A Guide to Capitalists and Emigrants: Being a Statistical and Descriptive Account of the Several Counties of the State of North Carolina, United States of America; Together with Letters of Prominent Citizens of the State in Relation to the Soil, Climate, Productions, Minerals, &C., and an Account of the Swamp Lands of the State. 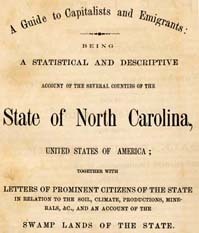 A Guide to Capitalists and Emigrants: Being a Statistical and Descriptive Account of the Several Counties of the State of North Carolina, United States of America; Together with Letters of Prominent Citizens of the State in Relation to the Soil, Climate, Productions, Minerals, &C., and an Account of the Swamp Lands of the State. Raleigh, N.C.: Nichols & Gorman, 1869. Capital investments -- North Carolina. Migration, Internal -- North Carolina. Natural resources -- North Carolina.